I recently decided to get a garter bar for my KX350 7mm machine. 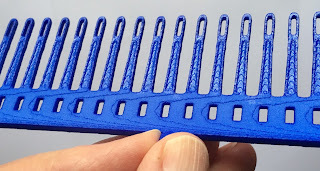 And found that Kris has discontinued her 7mm range, but an Internet search found a place that is now making 3D 20 prong ones. It looks like the company started in the Netherlands and now has a New York facility. Good news, so I decided to buy them. 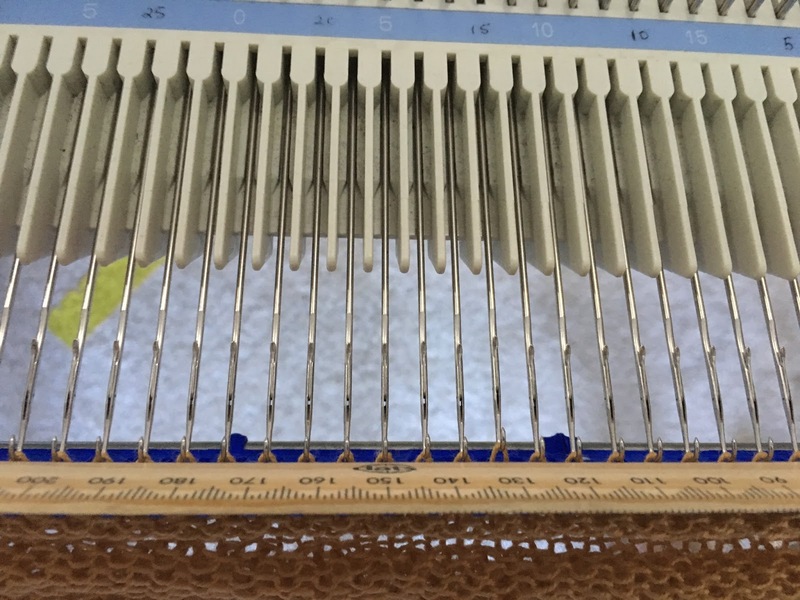 This is a 20 Needle / Tine 7mm Garter Bar: (40 needle version is available in this store) A garter bar is used on a knitting machine to remove the knitted fabric from the needles, turn it around, and replace the knitted fabric back on the needles. 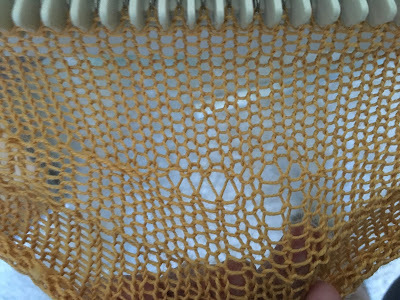 The ability to do this for an entire section of fabric (not just one needle) is necessary for garter stitches, and some lace patterns and cables. 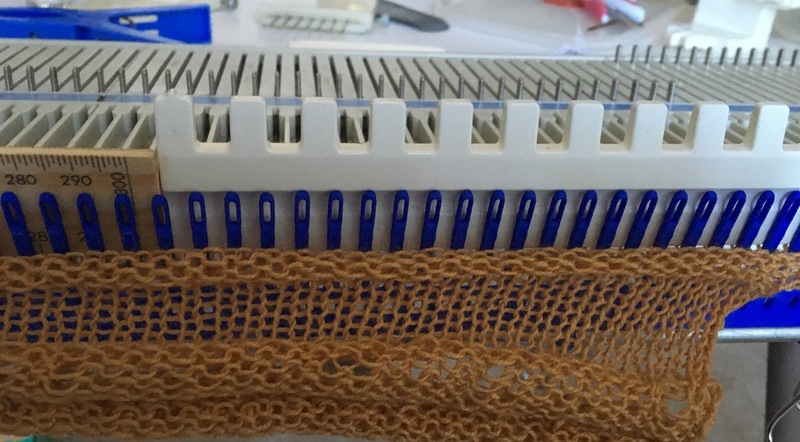 It can also be used if you have a need to temporarily remove a project from the machine. It fits 7mm machines. 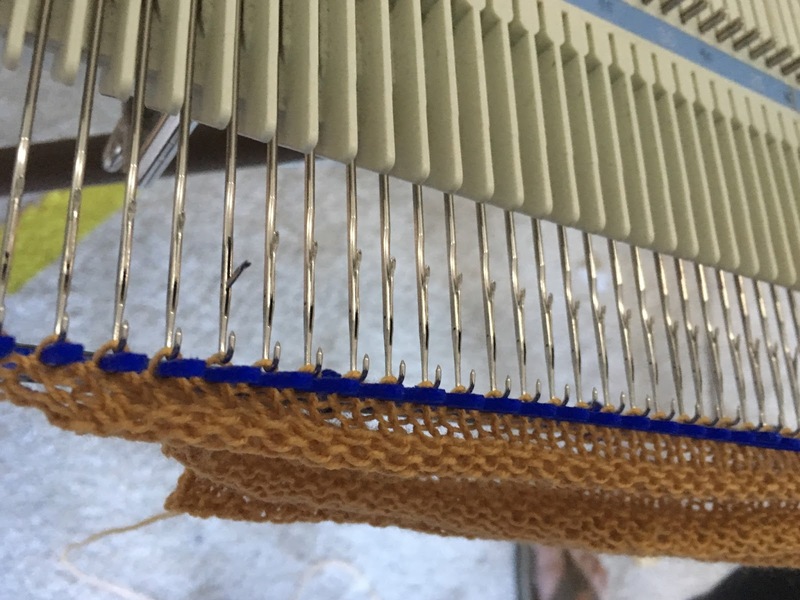 It can be purchased in sections of either 20 or 40 needles or tines. 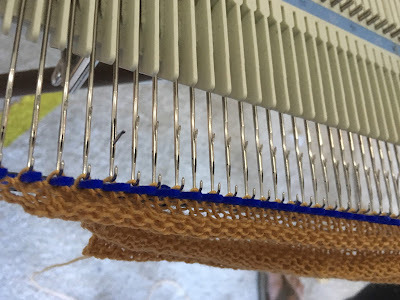 Purchase the number of sections as you need, depending on the number of needles in your typical project. Any number of sections can be used. 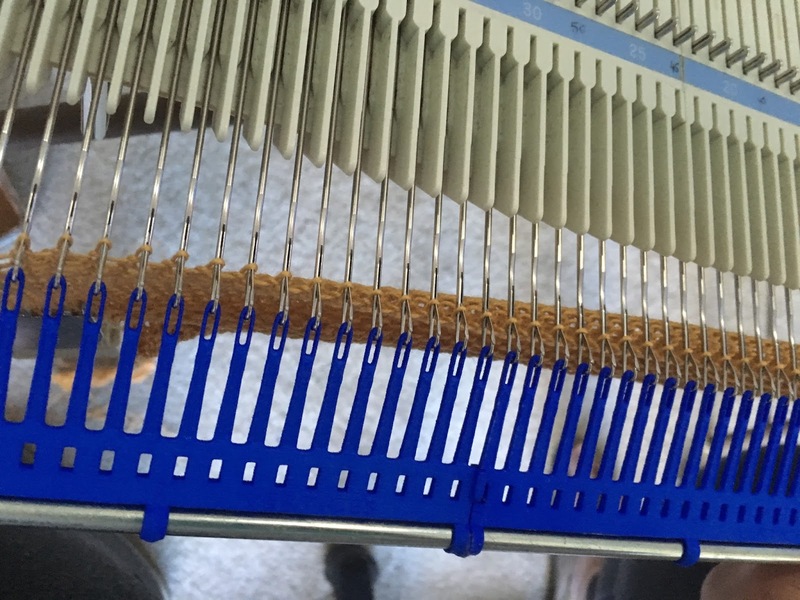 The sections fit together and should be secured together using a piece of 1/4” threaded rod with nuts and washers on the ends. Threaded rod is inexpensive and can be purchased at a hardware store. The rod should be cut to the length of the assembled garter bars, with enough room to add a nut and washer at each end. Note that this just needs to hold them together for convenience, it doesn’t need to be tight. 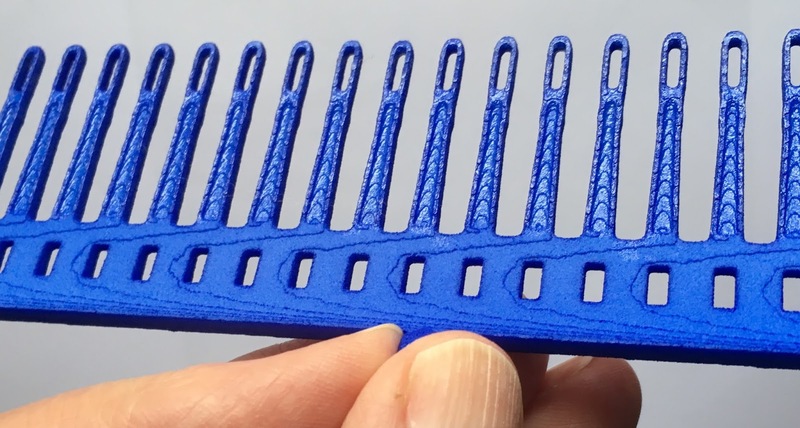 The material default for printing this is “White Polished”. Without the “Polished”, the surface of the material is slightly rough. 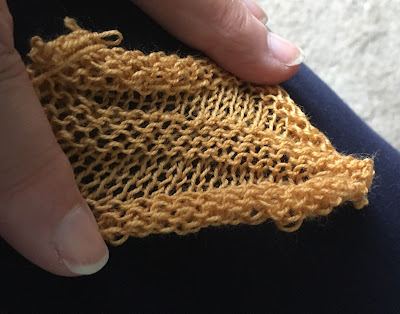 If you find that your yarn still doesn’t slide easily on and off the garter bar, spray it with several coats of a glossy clear coat spray available at craft and hardware stores. This will help smooth the surface even more. whinge about the underside being rough, they are and I've highlighted the bit that says that. So off I went to Bunnings to buy some fine emery paper and a metal bar. Was tricky finding the bar, it was hidden in the very bottom slot and that was the hardest part. It didn't take long to run the nail file along the underside and any of the prongs with rough edges then the fine emery. Here is a pretty good photo of the underside after I've sanded it and put three coats of nail varnish. use the single prong tool move the stitches onto the prongs in roughly a straight line. So how did I like using them? Most definitely quicker and easier than relatching, even though I only had one 20 needle one dry and ready to try out. Ready to come off the needles. I caught a couple of the prongs taking it off. will experiment with the best way to do that. 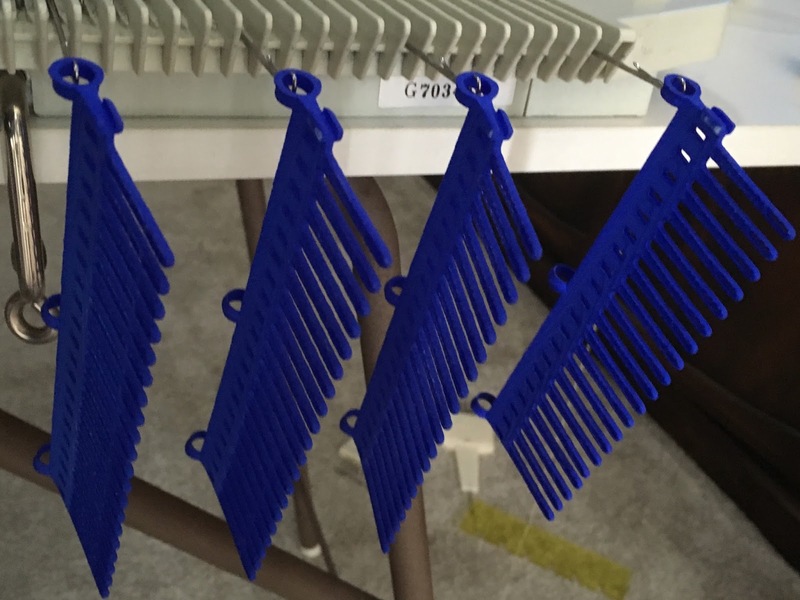 The bars are flexible and it took several goes to get it to collect most of them. Well I do like them, so much better than nothing. if here are too many missed, take it off the machine again and repeat (this is why I popped a couple of pegs to keep any of the work away from the needle tips). 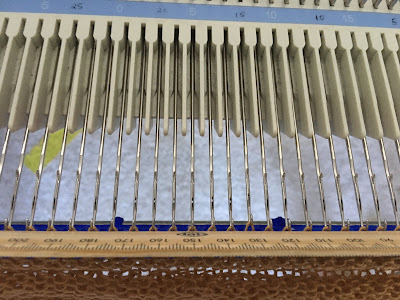 to stop the bar tips catching in the needles, I placed a selector ruler and a standard wooden ruler into the space between the prongs and the needles. 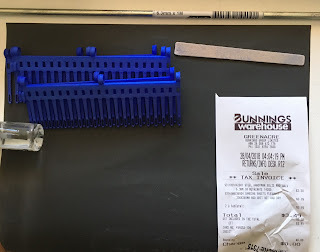 remove the pegs on the bar, if used. then pull down at an angle, I'd guess about 45 deg, underneath between the needles and the sinker plate. keep knitting, turning as you require. The metal rod worked well. I used a rubber band one end and a peg at the other, to hold them into place. Remember to take off the claw weights. I used some pegs to LOOSELY hold the work out of the way along the bar. Not tight, that didn't work. The prongs ARE grabby, rough, not smooth like the metal garter bars, that's for sure. However, It's not such a terrible thing. 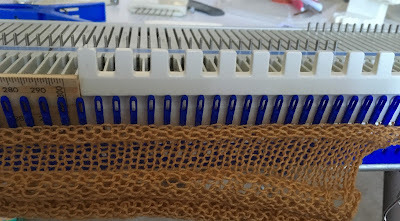 The stitches don't squirm all over the prongs and stay where they are put. 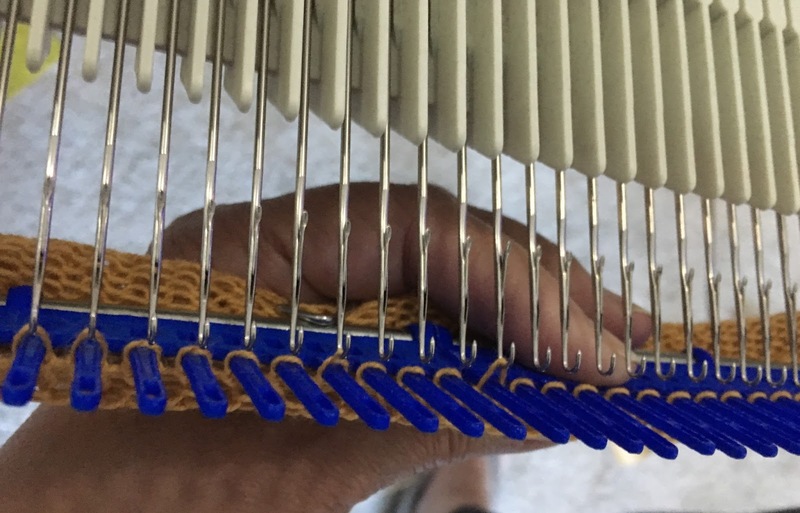 I did have to put a few onto to needles after turning the work, but I also have to do that with the metal ones and because they hold on, it's better, I think. So, am I happy with them? Yes. Did I find them rough? Yes but not too bad after three coats of nail varnish. I don't think it's necessary to have a slippery high polish after all. I won't be putting another couple of coats on. I like that they don't slip off the bar like I have had on the metal bars. And like the regular metal garter bars I've used before, they will take a bit of practice to proficient at using them. but after an afternoon I managed really well on the last one. I'm sure that the next project I have for them will be just fine.